Agriculture is the primary source of livelihood for over 58% of households in rural areas. Together with forestry and fisheries, it is one of the largest contributors to India’s GDP. India is home to over 20 agri-climatic regions, which are exposed to 15 different climate types. What is more, the country boasts 46 of the 60 different types of soils known in the world. Because of its size and climatic and soil diversity, India has two agricultural seasons – kharif (summer) and rabi (winter) – within one calendar year. India is the largest producer of spices, pulses, milk, tea, cashew and jute, and the second-largest producer of wheat, rice, fruits and vegetables, sugarcane, cotton and oilseeds. The country is second in global production of fruits and vegetables, but is the largest producer of mango and banana. 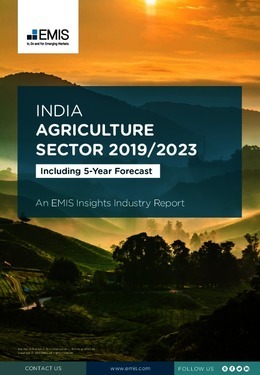 This report provides a complete and detailed analysis of the agriculture sector for India. EMIS Insights presents in-depth business intelligence in a standard format across countries and regions, providing a balanced mix between analysis and data. Gain an understanding of the regulatory environment for the sector in India.